In tandem with a teardown of Apple's iPhone 7 Plus, iFixit on Friday disassembled the new Apple Watch Series 2, finding a larger battery cell and slightly tweaked internal layout. As expected, the Series 2 comes with a higher capacity battery to handle the power needs of thirsty circuitry like a new GPS radio and brighter OLED display. 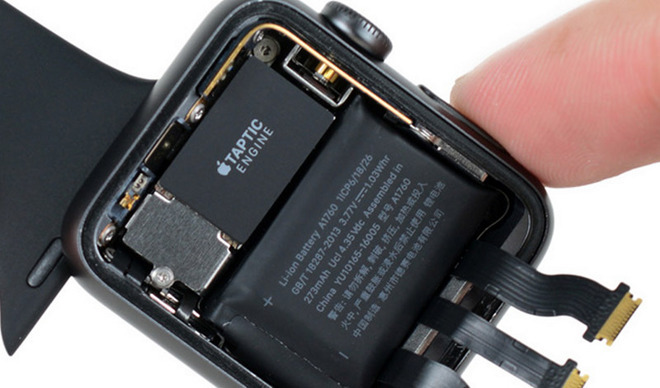 The 38mm version gutted by iFixit comes with a 273 mAh cell, up from the original's 205 mAh unit. In addition to the larger power unit, Apple is apparently using stronger adhesive to seal the OLED display to the aluminum watch chassis. The same tactic is applied to iPhone 7 Plus, suggesting the adhesive tape plays a role in the devices' water resistance. Unlike the original Apple Watch, the new Series 2 is "swim proof," or water resistant down to 50 meters. Other minor changes include the use of zero insertion force (ZIF) connectors instead of push-on sockets, copious amounts of adhesive to keep the battery secure and a repackaged Taptic Engine. Apple Watch Series 2 shipped to pre-order buyers on Friday alongside iPhone 7 and 7 Plus.